Life in Ireland so far. I'm sorry that I forgot to write on this blog. I forgot that there are some my precious friends who know about me through this blog. So, since I came here one and half months ago, I've been enjoying life in Ireland. This is my first experience to live in abroad for more that two weeks, and to live by myselft. I'm enjoying living by myself so much. I love my family and I like to live with my mom, but I am so free when I live by myself. It's true that there are many things that I gotta do by myself, which are done by my mom, but I enjoy cooking, and maybe that's the most wonderful thing that I don't need to take a bus nor train to meet my friends, and I can stay out until late. But sometimes, I miss my mom and her dinner. I wanna eat her cooking. 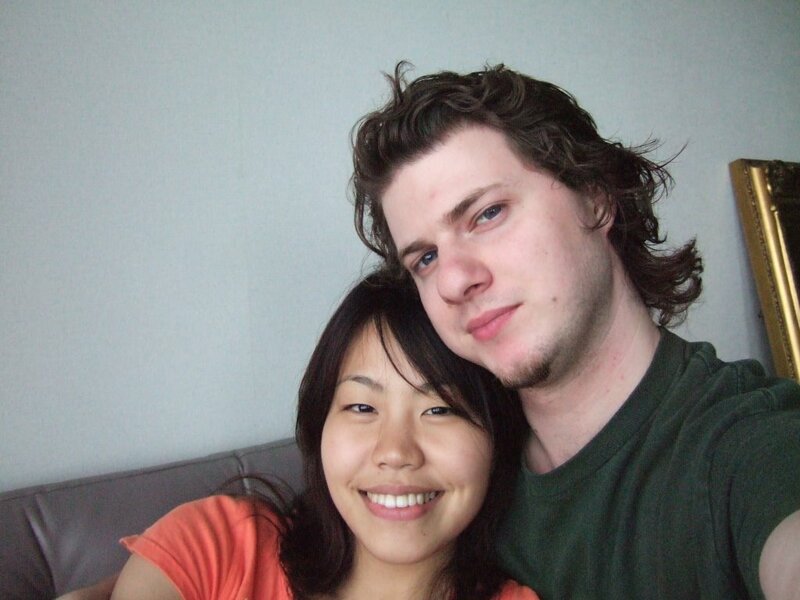 I sometimes talk with her on Skype, and I feel her love and kindness more than when I was in Japan, and I think it's a great thing. I like Ireland, and this university life. 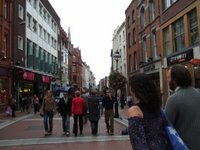 Prices of commodities are freaking expensive and the weather is sometimes so annoying, but I got used to it, and I like Irish friends. They are funny and kind people. I enjoy some classes. Also I'm learning Irish dance which I'd wanted to learn before I came here. It's was difficult to remember but fun. Ok,I'm gonna introduce some photos that you would be interested in. 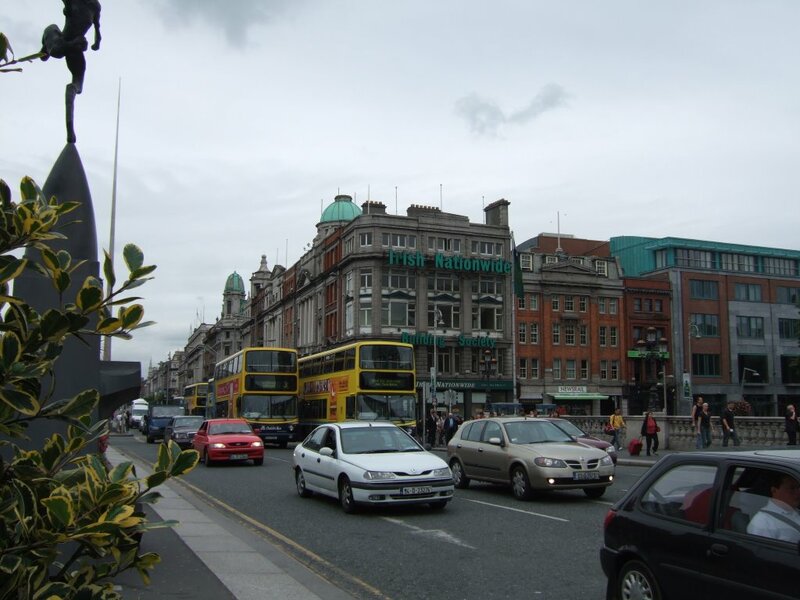 This is city center of Dublin. It takes 30mints from the university by bus. Compared to Tokyo, it's still small city, but there are many shops, pubs, and people. In the middle of city center, there is a "spire". 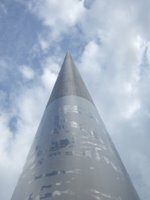 It's really tall and I don't know the perpose of it, but many people use here as a meeting point, and also it's useful when you get lost because if you walk to the spire, you can get to a main street. 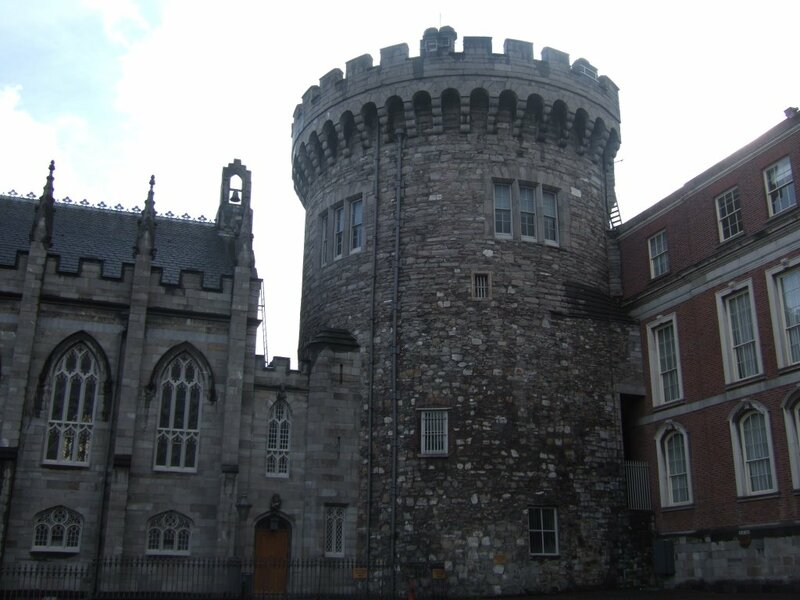 This is Dublin Castle. It's cool place and I liked here. People have to walk around with tour guide, and she explain history or something. We can see a chair of kind, a hall, basement and so on. I like to see castles. 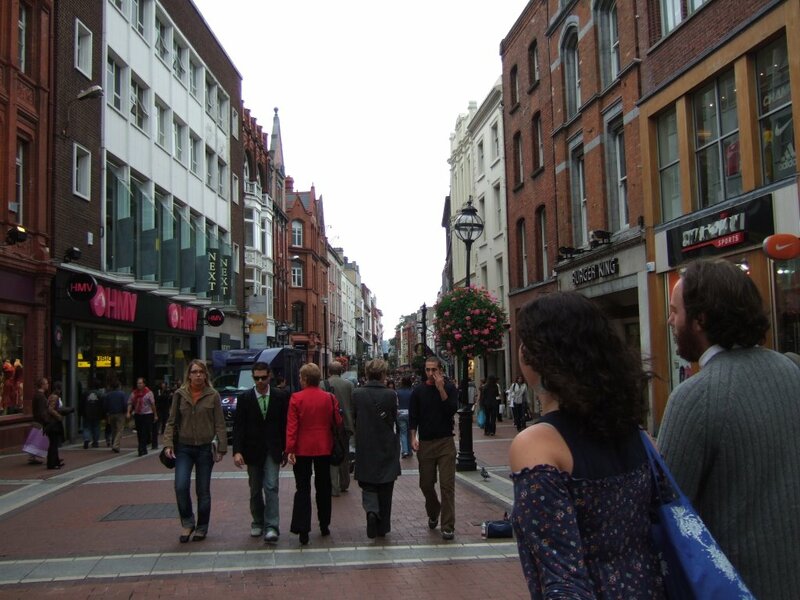 This is Grafton Street. It's a shopping street and also you can see many performances. 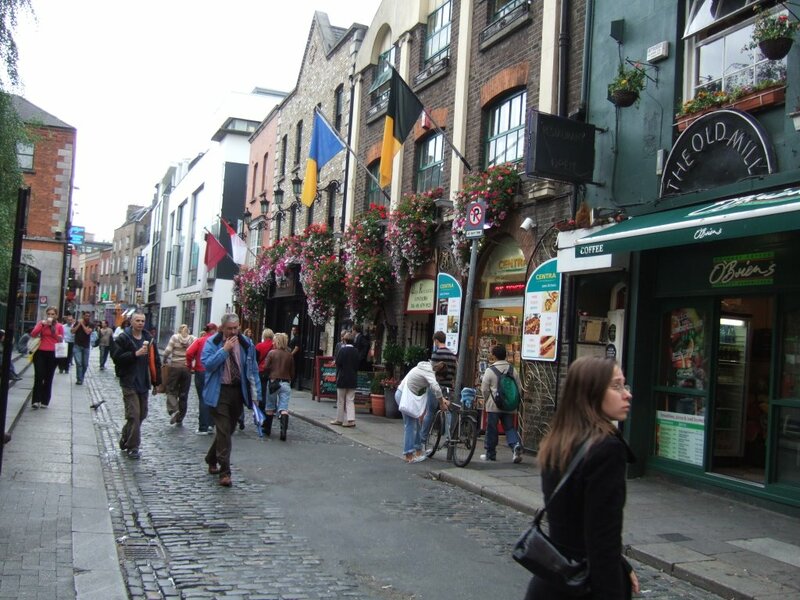 This is Temple Bar. It's just a name of the street, but there are many cool bars. But people who are under 21 cannot go to any bar on Saturday nights. Also there are some cool shops and on Saturday morning, there are several markets. This is Christ Church Cathedral. There are stained glass inside and that made me remind Firenze, but I don't like this church because people sell some books or something like that insede, and it's so improper and not christian. 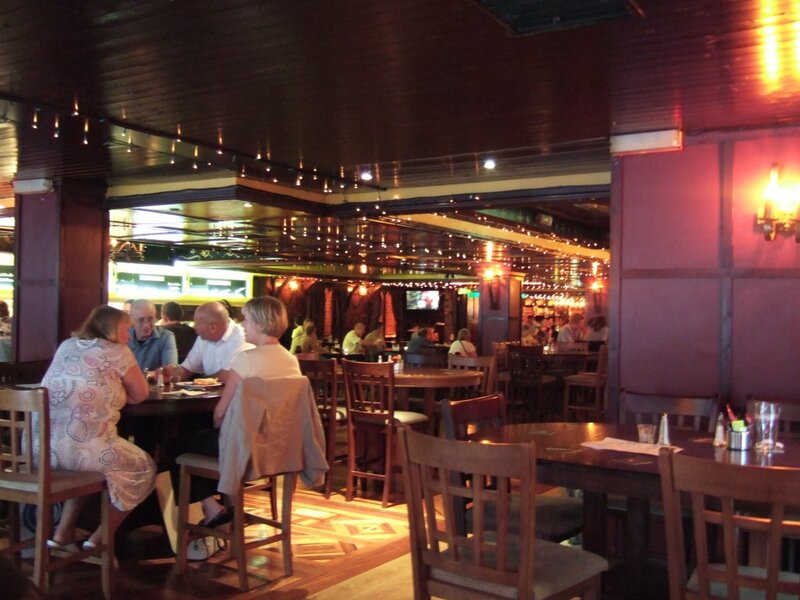 Isn't it a nice bar? It's a part of a hotel and I liked this place. You can listen to Irish traditional music and see Irish dance. But my friend's wallet was stolen in here, so watch out! 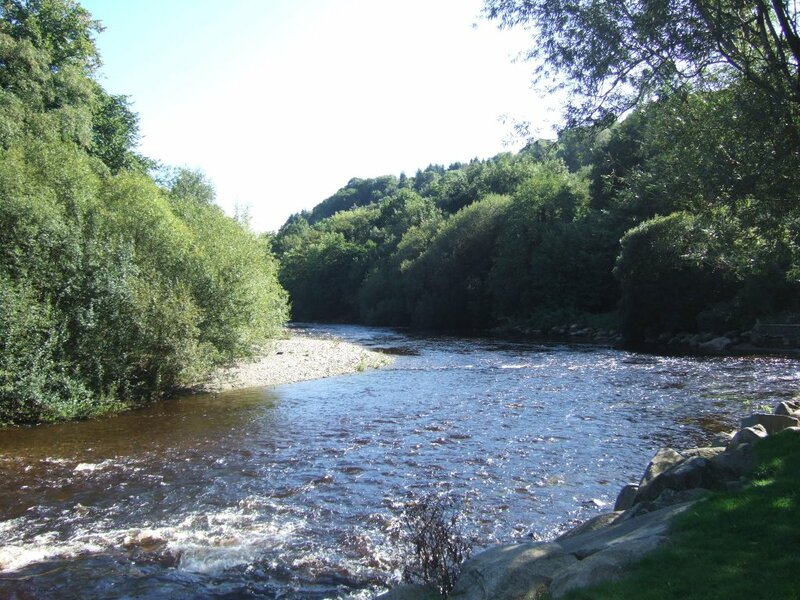 I've been only one place outside Dublin so far, and this is the place, Wicklow. There are many trees and green, and this picture is a garden of one house! So huge!! In Ireland, if people who have historical house or house with big garden open their house for public, they get paid from government. 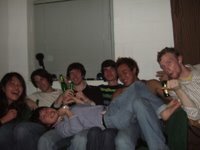 I apologize that this picture is out of focus, but they are some of my friends in Ireland. 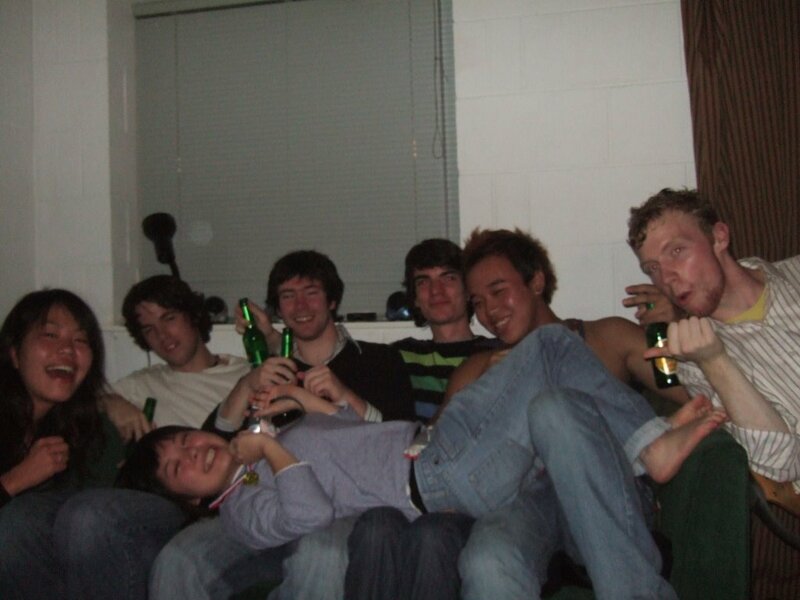 From left, me, Jan, Enda, Owen, Li, Adam and Azusa(on guys' knee). Ok, that's it so far. I'll upload it more often, so please have a look sometimes if you want!! 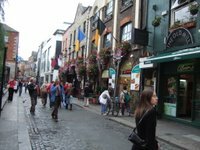 Maybe many of them know about it, but I started studying abroad in Ireland last Sunday. 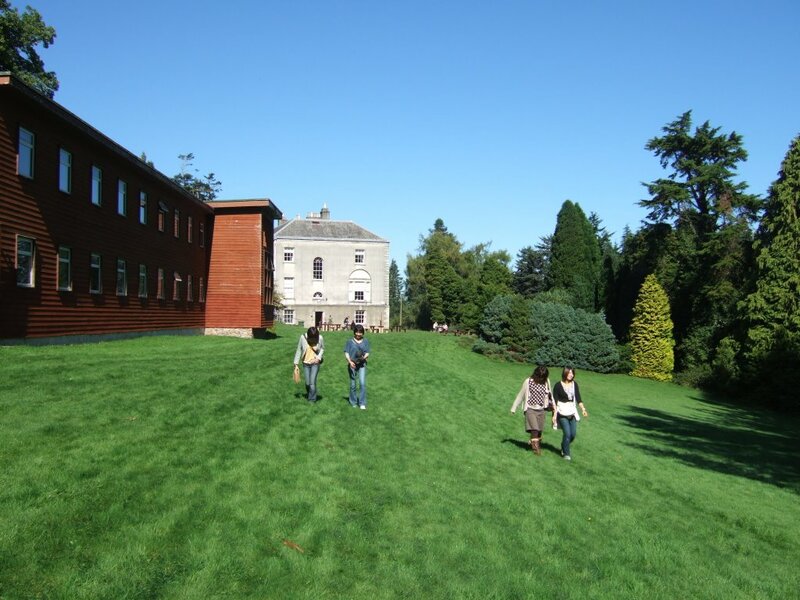 I arrived at Ireland last Sunday, and now I'm taking 3weeks classes to brush up my English skill with some Japanese students who are from my university. 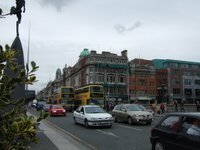 Ireland is colder than Japan, it's windy and rains almost everyday. I'll write my diary later on, but now, I'm tired a little and I have headache and backache. Anyway, I'm doing well so far! I'm sorry that I havn't written for a bit long time. I was busy so that I couldn't talk with Vieri and didn't know that Gizmo went to Italy. Last weekend, I went to Atami, where my grandma has an apartment, with TRANS member and Pat. 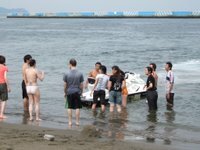 On Sat, we went to the sea and swam. Water wasn't so cold and I also went aboard a motorboat. 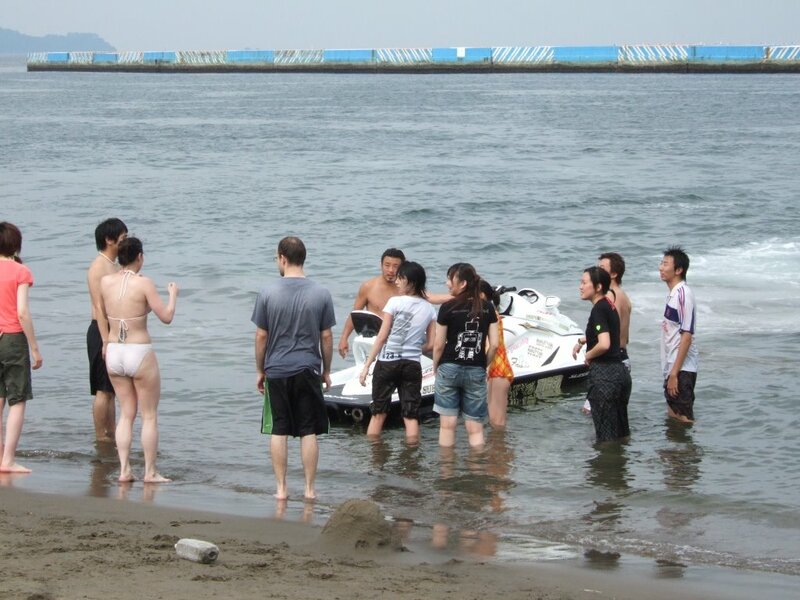 I hadn't swum in the sea for a long time, so it was so fun. At that night, we made curry moodle and okonomiyaki. We drunk after that till late. 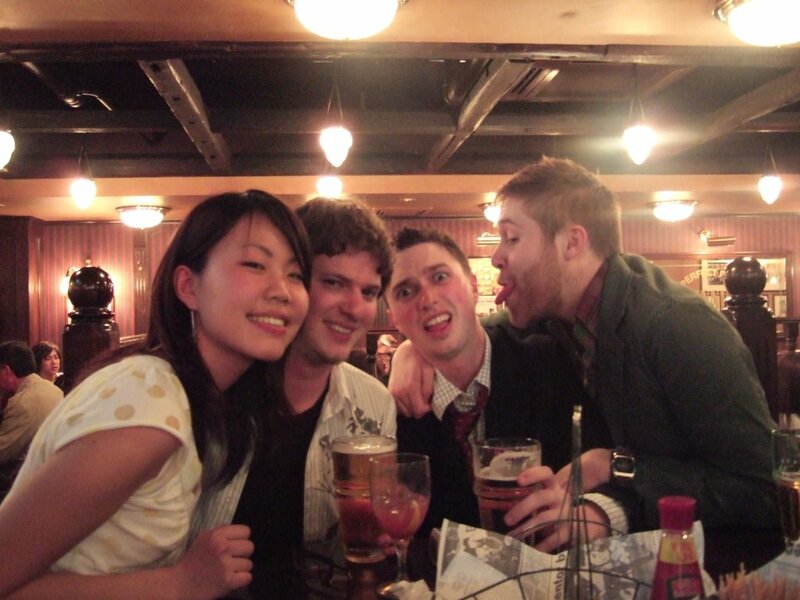 I had an argument with Pat, but it was a small one as usual, and I got a drunk a little. We planed to do fire works but it was raining. On Sun, I we woke up late and cleaned the apartment, and everyone besides me and Pat went to a hot spring. We relaxed in the apartment for a while and went to shopping. After we joined others and had a dinner, there was big fire works. I've loved Atami's fire works and I was glad that everyone loved it. There were some problems about their way of using the apartment, but it was great trip. I coulmake good memory with exchange students who are going to go back to their countries in 2 weeks, and I made some new friends. And above all, I had splendid time with Pat. Scusa, non ho scritto per lungo tempo. E stata occupata cosi' e non ho potuto parlare con Vieri e non ho saputo che Gizmo e' andato in Italia. Il fine-settimana scorso, sono andata a Atami, dove mia nonna ha un appartamento, con i membri del TRANS e Pat. Sabato, siamo andati il male e abbiamo nuotato. L'acqua e' stata non gelida e ho montato il motoscafo con qualche amici.Non ho nuotato per lungo tempo e sono piaciuto.A quella sera, abbiamo cucinato la pasta di curry e l'okonomiyaki (frettella di carne o frutti di fare con verdura). Abbiamo bevuto doppo fino a tarda. Ho avuto un litigio con Pat, ma e stato piccolo come al solito, e mi ho ubriacato. Abbiamo avuto intenzione di giocare con i fuochi artificiali pero' ha piovuto. 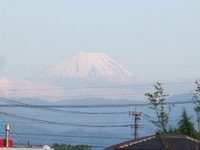 I went to my grandma's house in Yamanashi in this Golden Week (from 3rd to 5th, May) to do Seijinshiki. Maybe I explained before, but I'm gonna tell you what it is again. 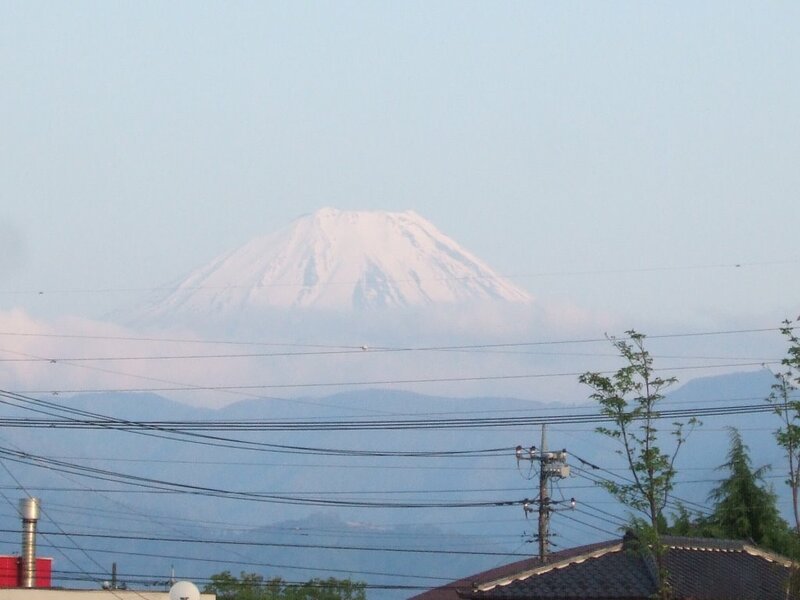 In Japan, we have big celemony in first January when we become 20 years old. We wear Kimono and go to kind of party. 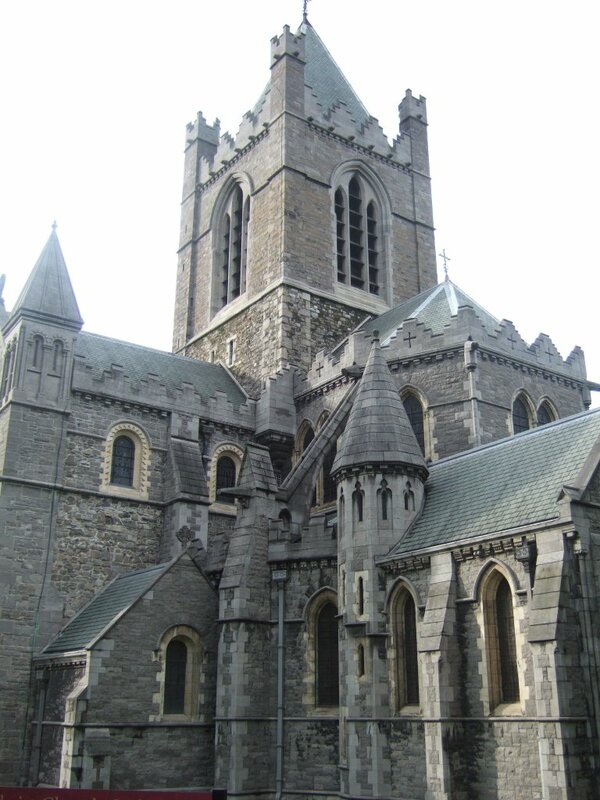 But I cannot go to mine because I'll be in Ireland at that time. So I did mini-Seijinshiki at Yamanashi with some relatives (mom,brother,great grandma,grandma,aunt and uncle) and Pat. 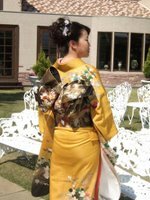 I wore yellow kimono, and stylist did make-up and my hair. I don't make up usually, so I think my face was wired and I was embarrassed. I took pictures by myself and with my family (and Pat). Then we had lunch, and Seijinshiki was over. We were all tired and my family fell a sleep as soon as we went back grandma's home, but I went out to a big field near a river with Pat and spend all afternoon. We ate Sushi at that night. 23rd was my birthday. I became 20 years old, which means I'm legal adult!! !First I went out with Pat to Odaiba. We walked around, watch a movie and talked about many things. He gave me a rose in the morning when we met, Keitai strap(?) of clover, a card with sweet words and two necklaces of heart and clover. 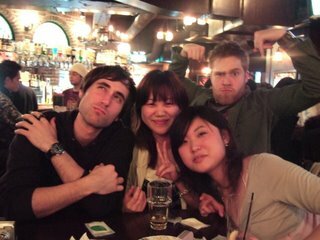 It was sweet date.Then at night, we had a drinking at pub with my friends. I asked many friends to come including many Japanese, but only my two best friends come...So there were about 10 foreiners! Anyway, it was really fun and I was glad coz such a many people say "happy birthday" to me and hugged me. Also Ale came and he talked with my friends. He can speak English very well and also, as I mentioned before, his Japanese is AWESOME!!! and sooo cute!!!!! mimissimo!! I went to a picnic in Yoyogi park yesterday. There were me, Pat, Gizmo, Ale and Chieko, and 4 Italian, 1 American, 1 half-American, Yuki and her 2 scottish friends. It was cold but there were lots of people in the park, and I enjoyed. I talked with Paolo, Gizmo's friend from Italy. We talked about my Italian. He said the best way to study Italian is to read Italian books. I told ithim that I sometimes write blog in Italian and when I write Italian, I translate English to Italian. It's easier than from Japanese to Italian because English grammar is more similar to Italian than Japanese. But he said everytime we translate to another language, there are some difference of meaning, so I shoud translate from Japanese to Italian directly because if I do Japanese to English and English to Italian, the difference will be double. I agree with him in some point, but I don't think I translate Japanese to English. When I was in junior high school, I did that when I wrote English article, but now, I can think almost in English. But...I don't know. Anyway, I believe to write blog in Italian is good practice for me, and I'm searching Italian book a little, but I can't find...>_< When I left Yoyogi park, I met my friends in high school. I was surprised, but they seemed more surprised because I was with lots of foreigners. After picnicwell,we went to 300yen bar at Shibuya. It was my first time to go there (I don't know Shibuya well anyway), but it was nice place. Every alcohol was 300yen and they weren't bad. 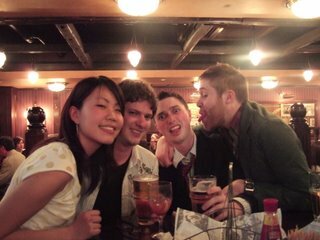 I drunk a lot (for me :P) and I enjoyed. I found Ale so cute sometimes. lol His Japanese is improving in awesome speed and I'm surprised everytime I see him. Ieri sono andata a fare un picnic a Yoyoghi parco. Ci sono stati io, Pat, Gizmo, Ale e Cieko, 4 italiani, 1 americano, 1 mezzo americano (come si dice "half-american"? ), Yuki e suoi 2 amici scozzesi. Abbiamo avuto freddo, ma ci sono stati molti genti al parco, e mi sono divertita. Ho parlato con Paolo, il ragazzo Italiano di Gizmo. Abbiamo parlato di mio studio dell'italiano. Ha detto, il megliore modo per studiare l'italiano e' leggere libri. Ho detto scrivo blog in italiano a volte. Quando scrivo l'italiano, traduco dall'inglese in italiano perche' sua grammatica somigliare alla gramatica italiana. Pero' ha detto devo tradurre dal giapponese in italiano perche' quando traduce ci sono qualche differenza tra due lingue, dunque se traduco dal giapponese in inglese e dall'inglese in italiano, le differenze sono doppio. Ho capito un poco ma non penso traduco dal giapponese in italiano. Posso pensare in l'inglese, non traduco...ma, non lo so. Quando abbiamo partito dal parco ho incntro mie amiche di liceo. Sono stata stupita ma hanno sembrando stupiti perche' sono stata con molti stranieri. Dopo il picnic, sono andati a 300yen bar a Shibuya. E' stata prima volta (comunque non so Shibuya bene) e e' stato bello. Ogni alcol e' 300yen e buono. Ho prenso cocktail molto (per me!) e mi sono divertita. Ho pensato che Ale e' mimmo spesso. Il suo giapponese e' migliorando molto. Sono sempre stupita. Grande mimmo Ale!! Non sono stata una ragazza chi piace Ohanami, ma ho la fatto ieri e oggi. Non e' stata vero ohanami perche' non ho preso alcol e sono andata con solo mio amico. Ieri sono andata a Kanda fiume vicino alla universita'. C'e' stato vento teso e freddo ma gli ciliegi e' stati molti belli!! Ci sono stato un sacco di gente e ho pensato che loro sono gli studenti della universita'. 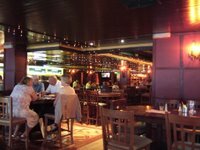 E poi sono andata a Ikebukuro per prendere l'intervista di lavolo a irlandese pub. La direttore ha detto che e' difficile prendere il lavolo li' perche molti genti vogliono lavorare. Poi sono andata a un altro pub com mio amici e ho avuto bello tempo. 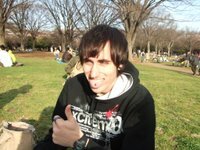 Oggi sono andata a Ueno parco con lo stesso amico.Ci sono stato un sacco di gente davvero e hanno fatto "vero" ohanami. Oggi e caldo e ho indossato una gonna che non ho indossato per pezzo. Gli ciliegi e' stati belli davvero ma molti petali sono gia' stati caduti perche' ieri c'e' stato vento teso. C'e' stata la festa patronale e c'e' stato un buon odore (pero' non ho avuto fame) C'e' stato anche il mercato di anticaglie e ho trovato le perline che madre di Vieri si ha interessato di, dunque le ho comprato. Dopo tornato a mia casa, ho studiato l'italiano un poco, e ho voluto parlare con Vieri ma non c'e' stato >_< Non ho parlare con lui per 2 o 3 giorni e gia' mi manca :P E' pensando a sua vita, e voglio la parlare con lui perche' mi piache lui quando dice di se' e suo segno.